Public.Resource.Org collects two kinds of information about users: 1) data that users volunteer by contacting us or donating to us; and 2) aggregated tracking data we collect when users interact with us. When you send us email, we retain that email. We never sell or rent your email address or other personally identifiable information you provide us under these circumstances. 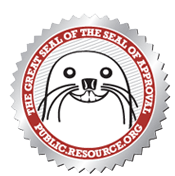 When you donate to Public.Resource.Org we retain your personal information for purposes of our accounting records and, if required, reporting to the I.R.S. We release personal information when we believe that release is appropriate to comply with the law, or to protect the rights, property, or safety of Public.Resource.Org Media, our users, or others. We analyze visitors' use of our sites by tracking information such as pageviews, traffic flow, search terms, and click through. We use this information to improve our sites. We do not use third party advertising. Email: To get help from a human, send email to carl [at] media [dot] org. Snailmail: To reach us with written communications via postal mail, please send mail to Public.Resource.Org, 1005 Gravenstein Highway North, Sebastopol, CA. 95472.